well, thought i was going to write about the beautiful flowers, but that will be for another day. 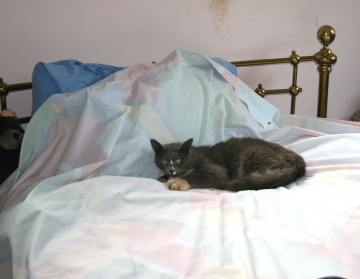 for some time i have been ‘bothered’ by a grey cat that tends to hang out around here. i was pretty certain that he came in here while i was gone, availing himself of the open window intended for mr pepe. there have been times when way too much food had been eaten(while i was out of town). and once, i discovered grey hair in the indentation made in the down comforter. and once, i even noticed a rather nasty odor in the bedroom – even tho i had been right here in this room, with the door closed cause it was too cold in there. i managed to make it go away with some febreeze, but was certain it had not been there before – which meant he had come in even while i was here! grrr. well, just a little while ago, after i had already been in there to close the window cause it was still too cool outside and the door had not been shut tight, etc. anyway, i just went in to pack my suitcase in preparation for leaving in a few hours – and this is what i saw!!! talk about surprised! and he didn’t (and hasn’t) run away. now we had seen him up at the big house yesterday – limping badly. and candace remarked that his front leg was very swollen. as you may be able to see, that paw is quite swollen. nothing i can do now. i was able to both pet him and even pick him up (as he was originally against my pillow! ) i won’t be here tonight, so won’t bother with it for now. if he is still here and docile when i return, i guess i will put him in a crate and take him to the vet. no money, but hate to see him suffer. perhaps it’s just a foxtail that can be easily removed? not sure what i will do if it’s something very expensive. can barely pay my current bills. dang. help!!! he is certainly dirty. and kinda skinny. guess the cats up there don’t leave much for him. i can’t put food out down here – skunks and raccoons! so, there you have my latest critter story/adventure. now it’s time to get myself ready. will have to stop at the rv and ‘re’dress as i forgot to bring home both the dresses AND the shoes! it’s another 3 hr drive. bad part will be returning tomorrow. class ends at 3:00, which means i will be out of there closer to 4:00 – and any time after 3:00 is bad news coming up the highway. need to get home for the second celtics’ game. sorry the bruins lost last night – no more playoffs for them this year. still, they did way better than expected.